FILE - A US forces soldier guards the site after a suicide bombing attack near Kabul's international airport in Kabul, Afghanistan, May 17, 2015. Afghan President Ashraf Ghani has welcomed the U.S. decision to slow its troop drawdown in Afghanistan and leave a contingent of 8,400 personnel there when U.S. President Barack Obama leaves office in January of next year. "President Ghani underscores the important role of the U.S. as a strong and reliable partner, especially in the war on terrorism, and appreciates the U.S. military's technical and security cooperation” with the Afghan National Security and Defense Forces," according to an Afghan government statement. The number of U.S. troops was due to drop to 5,500 from its current level of 9,800 by the end of this year; but, President Obama said Wednesday that Afghanistan's security situation remains precarious. He said his decision "also sends a message to the Taliban and all those who have opposed Afghanistan's progress. You have now been waging war against the Afghan people for many years. You have been unable to prevail. Afghan security forces continue to grow stronger. And the commitment of the international community, including the United States, to Afghanistan and its people will endure." FILE - In this May 27, 2016 file photo, a member of a breakaway faction of the Taliban fighters guards a gathering in Shindand district of Herat province, Afghanistan. The Taliban has made unprecedented battlefield gains since 2014, when, after more than a decade, the U.S.-led foreign military coalition wound up its combat mission in Afghanistan and transferred national security responsibilities to Afghan forces. The United Nations estimates the Taliban now controls more Afghan territory than at any other time since the U.S.-led invasion following the September 11, 2001 terrorist attacks in the United States. The U.S. military mission is advising, assisting and training Afghan forces in addition to conducting counterterrorism missions against al-Qaida-linked extremists and Islamic State, which is trying to establish a foothold in the country. 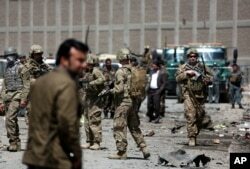 “Even as they improve, Afghanistan security forces are still not as strong as they need to be,” President Obama said. FILE - US forces and Afghan security inspect the site after a suicide bombing attack near Kabul's international airport in Kabul, Afghanistan, May 17, 2015. Critics do not expect the change in U.S. troop levels to produce any major improvements in the Afghan security situation. Michael Kugelman, a senior associate for South and Southeast Asia at the Woodrow Wilson International Center for Scholars, says that more than 100,000 U.S. troops did not bring peace and calm to the country or end its long-running war. 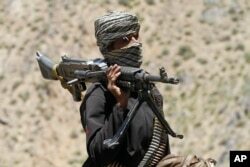 "So long as the Taliban has sanctuaries in Afghanistan and neighboring Pakistan, and so long as economic malaise, rampant corruption, and violent militias make life so miserable for ordinary Afghans that some view the Taliban as a better alternative to the government, then war will continue - no matter how many U.S. troops remain," wrote Kugelman in an article for The Wall Street Journal. Meanwhile, President Ghani on Thursday left Kabul for Warsaw, where he will attend a two-day heads of state summit of NATO’s member countries that begins July 8. Ghani is expected to secure funding for Afghan national security forces and troop commitments for NATO’s Resolute Support Mission in Afghanistan.